For carrying extra ammunition into battle, the American soldiers were issued bandoleers. These six-pocket cotton slings were expandable, which meant so much as that they were to be thrown away when emptied. These bandoleers were also means for supplying the GI’s in the field. They emptied the bandoleers and filled their cartridge belts with the 8 round “en-bloc” clips. If there was time enough they also removed the cartons from the bandoleers they were taking into combat so that when they pulled out a clip it would be ready to be loaded into the rifle. 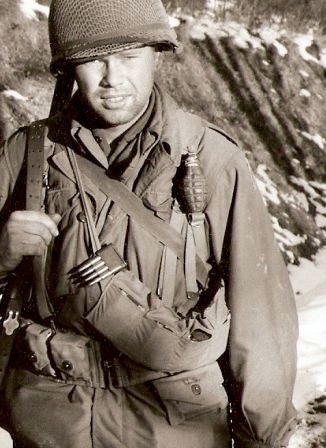 In many photos taken of infantrymen one can see the bandoleer being carried slung around the shoulder. Sometimes the infantry is using the bandoleer as their only means for carrying ammo when have shed all their other equipment. This was done mostly in case of a patrol or some scouting activity, when it was necessary to travel light and fast. Even such a simple thing as a expandable bandoleer underwent some changes, or, improvements. One thing that evolved is the color of the cotton fabric. From the early khaki/brown to OD #3 to the OD#7, and the mix of these during the change over. 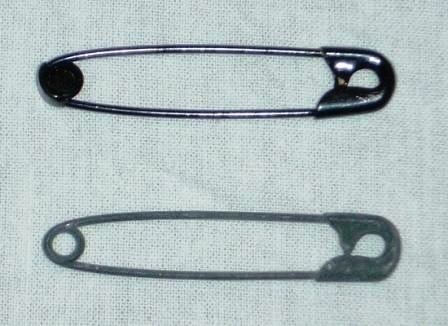 A safety pin was issued with the bandoleer, so it could be pinned to the soldiers webbing equipment or clothing with the purpose to prevent shifting. The safety pin could also used to shorten the carrying strap, but usually the GI’s just tied a knot in it to make it shorter so it would ride higher on the body. This was done to make it sway less and to prevent to become snagged, especially when running in a crouched position. The early type pin used was made of brass en lacquered with a shiny black finish (top). The later type was made of steel and had a gray kind of parkerizing to prevent rusting (bottom). 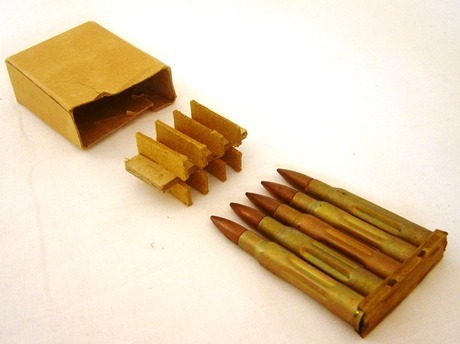 The 8 round “en-bloc” clip was first inserted in a protective cardboard sleeve, so the cartridges wouldn’t get scratched or otherwise damaged during the assembly of the bandoleers and the packing of the filled bandoleers. It also facilitate insertion of the clip into the bandoleer. There was no official design and several different types were used. (The second sleeve from the left has a tuck-in flap at the bottom.) These sleeves also differs in quality of material used. The WWII sleeves differ from the post war ones that they cover the whole clip. The post war sleeves only covers the exposed part of the cartridges and not the clip. The sleeves were not marked in any way. With each bandoleer comes a small card which identifies the type of ammunition (ball cal. .30 M2) and the manufacturer with the lot number. If encountered any problems (defects) with the ammunition the card should be returned to the manufacturer. Again the design and paper used for these card differs in quality. Only at the very end of the war the manufacturers started to print this information directly on the bandoleer in order to eliminate the use of this card and to facilitate identification. Two cards are for the regular ball (M2) ammunition and two card identifies the ammunition as armor piercing (A. P.). The card at the extreme right came from a bandoleer that was packed with “five round” stripper clips. Early in the war, when the Springfield ‘03 rifle was still the standard issue rifle, the bandoleers used were the old left overs from WW1. These bandoleers are easy to identify, because of their heavier fabric and a more distinctive “pink-ish” khaki color. The cartons used with this bandoleer are shorter, without a cut-out. Inside the carton is a “bullet-divider” (shown right). This was replaced by a simple piece of cardboard in WW2 (below). The bandoleers with the stripper clips were produced to supply the Springfield ‘03 rifle that was still in use as a substitute rifle. Two 5-round clips were inserted in a cardboard sleeve with a separate piece of thick board placed between the bullet points. Bandoleers were only used for rifle ammunition. Magazines for the BAR were supposed to be filled by hand. (There was a device (magazine filler) to help to empty a stripper clip into the magazine, but was seldom used, or available, in the field.) The cartridges used to fill these magazines were supplied in cardboard boxes, containing loose rounds. In combat this usually wasn’t the case and ammunition was supplied in a way of bandoleers (usually the ones that were issued for the type of rifles the rest of the squad was armed with) or taken from machine gun belts. 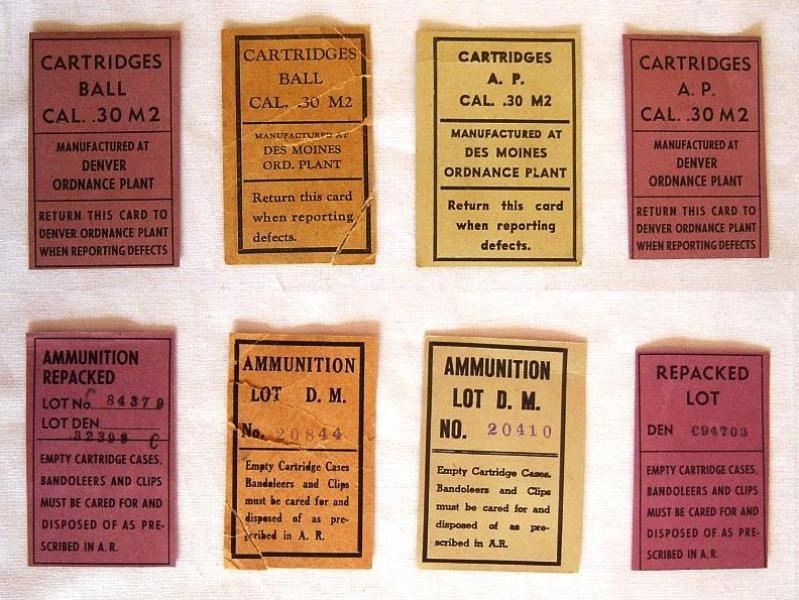 Carbine magazines were refilled with loose rounds supplied in carton boxes. The bandoleers with the ten round stripper clips for the carbine are post war. Bandoleers were sealed in an metal container and than packed in a wooden crate. 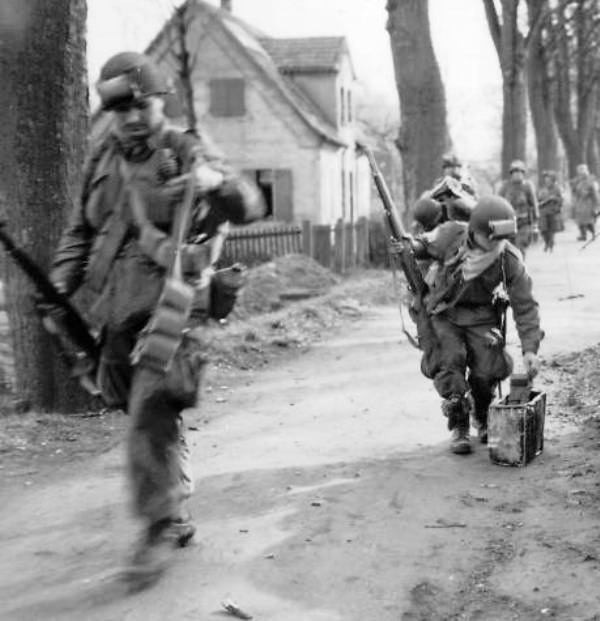 Here can be seen 17th Airborne soldiers picking up bandoleer. This is how soldiers were resupplied in the field. They just slung the bandoleers around their shoulders while moving on. At the next opportunity they will redistribute their ammunition, meaning, putting loose clips in their cartridge belts or hang the bandoleers in a more comfortable way. 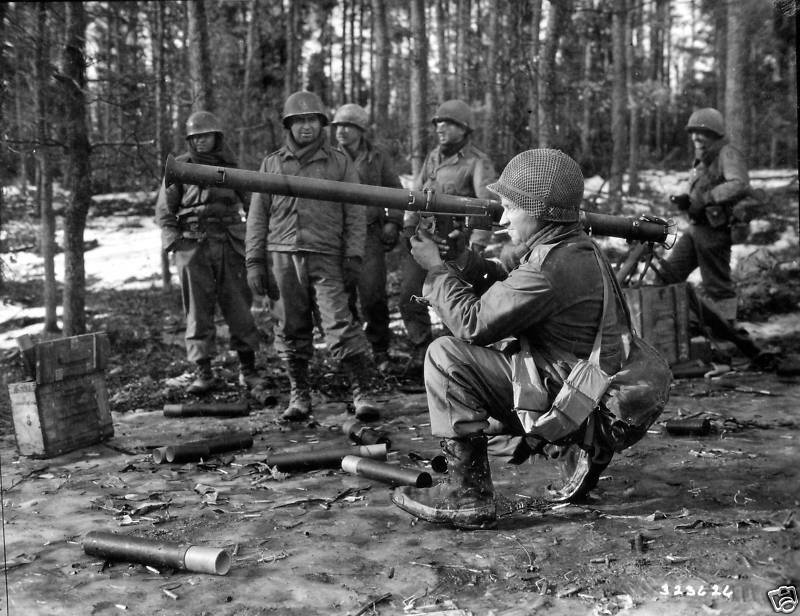 Shown here is a photo of a field practice with the bazooka. 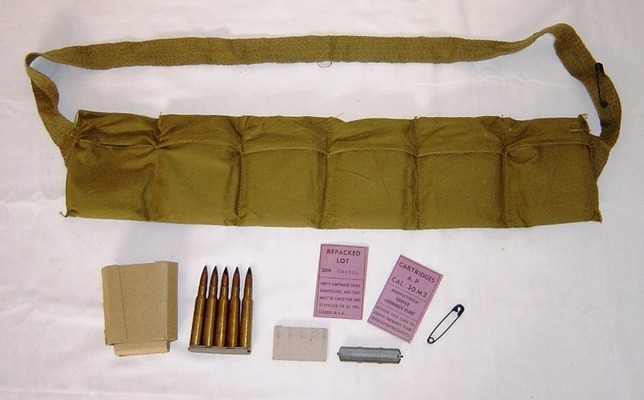 The soldier holding the bazooka carries a bandoleer with the clips still in its cardboard sleeves, as can be seen by the square shape of its contents.